S9 Architecture is helping turn an old Ford Model T and army missile manufacturing facility in Charlotte, North Carolina, into the city’s newest hub for creativity and innovation. Camp North End, a long-empty industrial site just northeast of downtown, will feature 1.8 million square feet of office, retail, and event space set inside its historic, early 19th-century factory. New York-based developer ATCO Properties purchased the site in 2016 and opened it to the public last year. Various vendors have populated the grounds, and it’s been a hotbed of activity ever since, housing countless companies and office space for coffee roasters, media professionals, artists, and startups alike. It’s also been home to several exciting festivals and arts programs put on in the various open spaces. S9’s master plan for the 76-acre campus will transform the site into a sustainable spot for businesses to put down permanent roots. ATCO brought on S9 to collaborate on the adaptive reuse of the complex’s 12 main buildings and connect them through experiential passageways. In between each structure, the team will lay out gathering spaces for people to eat, hang out, or put on events. The build-out will also include space for future residential and hospitality developments. While many of the buildings on the site are already in use, ATCO and S9 are renovating four larger areas in the first phase of construction: the Gama Goat Building, the Mount, a 24,000 square-foot former Ford factory building, and the adjacent boiler building. The latter two were designed by Detroit architect Albert Kahn in the 1920s. The design will substantially retrofit the dilapidated structures and add a contemporary edge to the facility. This isn’t the first large-scale placemaking project the Brooklyn-based firm has done in recent years. S9’s design for Ponce City Market converted an outdated Sears building in Atlanta’s Old Fourth Ward into a coveted piece of real estate for top tech companies and local food vendors. 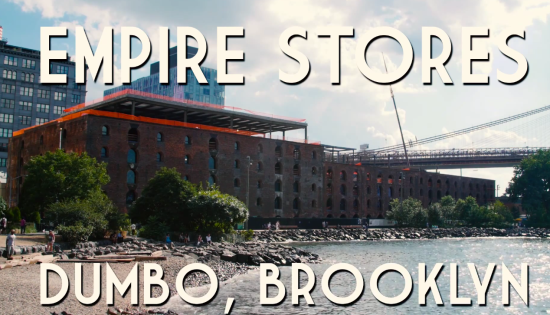 Also under the firm's industrial reuse belt is Dumbo’s Empire Stores in New York City, as well as Dock 72 in the Brooklyn Navy Yard, home of WeWork’s New York headquarters. As major changes and speculation over what’s next hover around the Brooklyn Navy Yard, S9 Architecture’s Dock 72 office tower is nearing completion. The stepped, 16-story building is currently receiving its facade, and co-working company WeWork has already laid claim to 220,000 square feet of office space. With so much ground-up space to work with, the company (and developers Boston Properties and Rudin Development) has tapped local firm Fogarty Finger to design the amenity spaces for their new digs Fogarty Finger took cues from residential and hospitality design to impart a softness throughout, which, given their track record in designing high-end office spaces, is why the studio was chosen for the job. 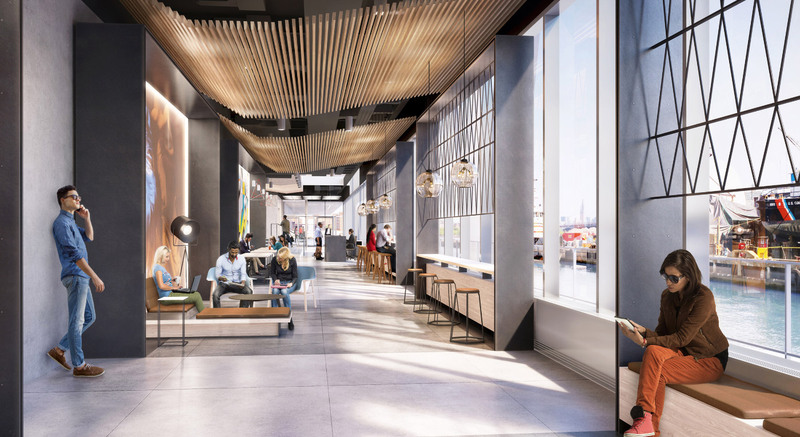 From the renderings, it seems the interiors are a step up from WeWork’s typical glass-and-reclaimed-wood look, usually handled by their in-house design team (Bjarke Ingels had no role in the project, either). 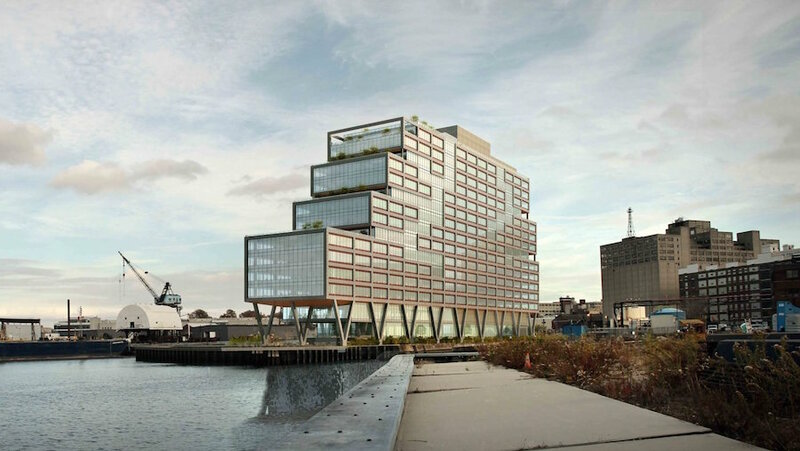 Dock 72 is the first ground-up office building to be built in Brooklyn in nearly 30 years, and given the building’s Class A ratings (the highest office standard) and waterfront views, Fogarty Finger was responsible for designing 35,000 square feet of high-end amenities. Two bar-and-lounges, one on the ground floor, the other adjacent to the 16th floor’s conference center, a 600-foot-long, 30-foot-wide lobby that runs the length of the building, a juice bar, spa, gym, café, and a market. The interiors lean heavily on an industrial aesthetic (concrete floors, black steel columns), with strategic splashes of warm wood paneling along the ceiling and a white oak trim in the furniture. In keeping with the Navy Yard's effort to bolster New York City's manufacturing base, local manufacturers from the yard were invited to curate the public areas. As founding partner Robert Finger describes it, Dock 72 is only the latest project to escalate the included amenities as developers try to capture Class A office space tenants; high-value tech employees in this case. Once the next phase of the Navy Yard’s expansion is complete, Dock 72 will link up with a suite of planned waterfront amenities surrounding the office core. Taking shape along Greenpoint’s once-industrial waterfront district is a series of surprisingly contextual modern condo developments using red brick and exposed black steel to tactfully insert tens of thousands of new residents along this sleepy East River shoreline. The largest of them, a 30-story tower that is part of Handel Architects’ Greenpoint Landing, includes 5,500 units sprawled over 22 acres at the mouth of Newtown Creek, with 1,400 apartments renting for as little as $393 to $1,065. Initial renderings presented for public review surfaced as bland massing diagrams, but the subdued details of Handel’s build-out hold promise for communities becoming accustomed to glossy, glassy, boxy towers in districts where rezoning permits greater height and bulk. To the stakeholders’ credit, the developer showed them a selection of schemes to choose from, including designs by Renzo Piano Building Workshop. In contrast to Long Island City’s gleaming, generic masses and Williamsburg’s spotty, uneven edges, Greenpoint’s waterfront retains enough of its traditional shipping warehouses to sustain the contours of a characteristically industrial neighborhood along West and Commercial Streets, even if most of the industry is gone. Despite a major waterfront rezoning passed by the city council in 2005, until a few years ago, most of West Street continued to host storage for building material and scaffolding, a lumber manufacturer, and a crane and equipment rental company. After large portions of Greenpoint Terminal Market were lost to a ten-alarm fire in 2006, Pearl Realty Management adapted the remains into a studio-and-workspace rental complex, an extension of its Dumbo-based green desk co-working enterprise. Slowly, smaller firms like Daniel Goldner Architects, Karl Fischer Architect, STUDIOSC, and S9 Architecture populated the upland side of West and Commercial with renovated warehouses and upscale condos echoing the material palette of the existing low-rises. Much of the post-rezoning development along West and Commercial stalled due to the 2008 mortgage-backed securities crisis. In 2009, the former Eberhard Faber Pencil Company building became the Pencil Factory lofts, and Daniel Goldner Architects filled in the corner lot with a syncopated colored brick addition and perforated aluminum garage. The project struggled in the post-crash housing market. But in the past two years, a rush of new buildings began to rise up along West and Commercial with a distinct material selection: red and light-colored brick and exposed black-painted steel, with glazed entryways and antique fixtures. Karl Fischer Architect’s 26 West Street opened in 2016, its redbrick and black steel facade filling out the six-story street wall, its large overhang resembling a meat market loading dock. 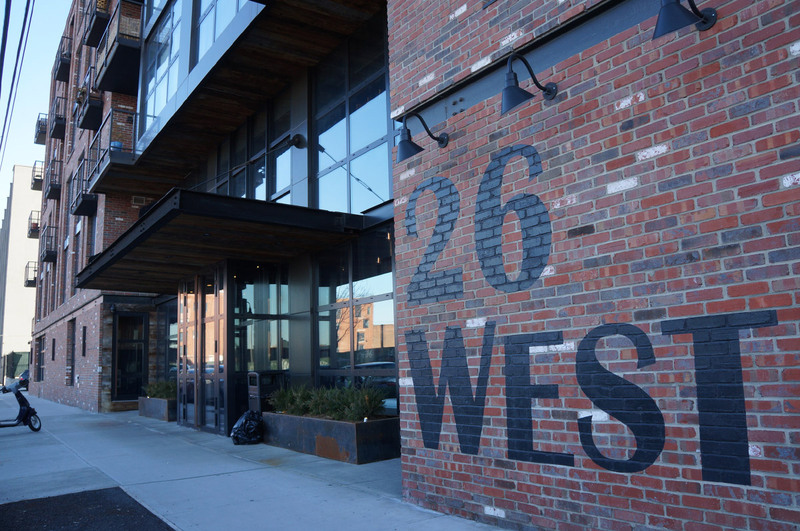 The warehouse modern–aesthetic even extends all the way around the mouth of the Newtown Creek, where a 105-unit building by S9 Architecture employs the same neotraditional style—red brick, exposed black steel, industrial awnings, antique fixtures. An upscale ground-floor grocery store warmed some nearby loft residents up to it after months of sound-based trauma from the drilling of pilings. With leases from $3,350 to $4,350, locals will never be at peace with the rent pressures that come with these buildings, but at least they have the virtue of not extravagantly showing off their residents’ income. Not everything conforms to this trend: The expansive 140-unit development under construction by Ismael Leyva Architects at 23 India Street more crudely fills in its zoning envelope with affordable housing ranging from $613 for studios to $1,230 for winners of the NYC Housing Connect lottery, capped by a 39-story, 500-unit condo tower that promises in every way to form a bland massing diagram in the sky. In any case, contextual exterior cladding is little consolation for a community that fought hard for its 197-a plan—completed in 1999 and adopted by the city council in 2002—which would have allowed significantly less bulk and height, aimed to retain more light-manufacturing jobs, and mandated more affordable housing along with waterfront access. Jane Jacobs, in one of her final written statements, penned a strong defense of the original community plan against the eventual zoning resolution. Of course, the trade-off forced by the city—an upzoned waterfront in exchange for publicly funded parks and developer-mandated walkways—has already helped reduce heavy-industrial pollution, killed a proposed Con Edison power plant, and reduced and eliminated waste-transfer facilities and truck fumes. Some residents are just waiting for the dust and noise of construction to subside, while others hope for another recession to slow down the accelerated activity. In 2009, Andrew Blum published “In Praise of Slowness," for the launch of Urban Omnibus that, in retrospect, should have a more durable life as a critique of fast development. For New York City neighborhoods, slowness provides a much-needed stability in the absence of state-level expansion of rent regulation to protect against predatory development. 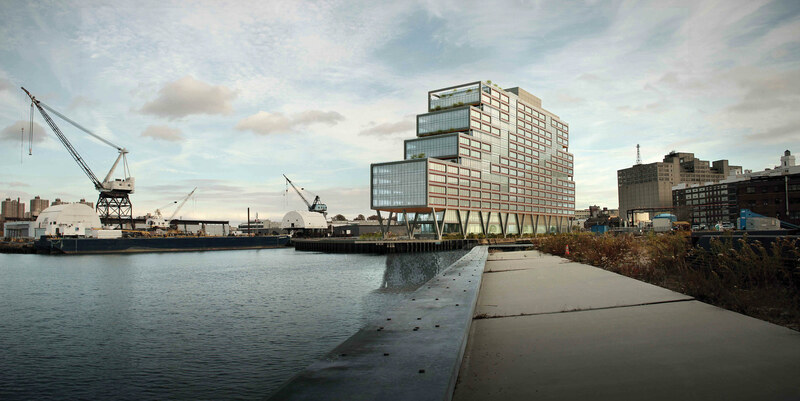 Yet if there had to be luxury condos facing the former industrial piers, the emerging Greenpoint warehouse modernism was a more subtle and site-specific solution than anyone expected or imagined. In the Brooklyn Navy Yard's latest development benchmark, the S9 Architecture-designed office building on Dock 72 has finally topped out at 16 stories over a year after it began construction. The building's anchor tenant will be WeWork, a coworking organization which has committed to 220,000 square feet of the 675,000 square foot building. A portion of this space will also be dedicated to communal space programmed by WeWork, now well-known for its open-format office plans. These spaces will include a public lawn, a health center, a basketball court, and a conference center. S9 Architecture's designs for the stepped structure are partially inspired by the shape of a boat hull, a reference to the Navy Yard's past as a shipping hub. Its interior is informed by the organic, roving nature of ant farms, according to the architect, with split-level social spaces visible through the gridded glass and steel frame exterior. The building also features several outdoor terraces accessible through the communal spaces — in line with WeWork's mission to create more community-focused work environments. WeWork will design all its own interiors, which have become a calling card of their branding. With homey couches, warm wall graphics and a focus on wood and copper textures, their offices often resemble hip coffeeshops more than offices, and almost all of them actually do contain a coffee counter with an ever-changing roster of public programming. Dock 72's ground floor, supported by 20 V-shaped steel beams, will be designed by Fogarty Finger and contain the building's dining facilities. The project's topping out marks the next phase of a major new development for the Navy Yard, which will also include a Wegmans supermarket in the old Admiral's Row building and a massive Green Manufacturing Center—the tenants of which are, in an unlikely coupling, a body armor manufacturer for the U.S. Military and a Marvel Architects-designed research and manufacturing space called New Lab. Marvel will also be working on the ground floor of one of the Navy Yard's largest projects, Building 77, a one-million-square-foot structure bridging DUMBO and Williamsburg. Additionally, MAST Brothers Chocolate Makers and Brooklyn Brewery will be moving into newly renovated spaces within the 300-acre mega-development. Update 7/18/17: This article originally misstated the name of the retail complex under construction on Staten Island. It is Empire Outlets, not Empire Stores. Update 7/19/17: This article originally named S9 as design architect and Perkins Eastman as architect-of-record for the New York Wheel. The two firms are associated architects on the project. It looks like plans for a giant Ferris wheel on Staten Island have ground to a halt. Court papers reveal the designers, Mammoet-Starneth, left the job in May after a pay dispute with the developer. Now, plans for the New York Wheel are on hold. The 630-foot-tall structure—slated to be the largest wheel in the Western Hemisphere—is in easy walking distance of the St. George Ferry terminal on Staten Island's north shore. The project, part of a $1.6 billion waterfront revitalization plan intended to lure tourists to the borough, is adjacent to the Staten Island Yankees (minor league baseball) stadium as well as Empire Outlets, a SHoP-designed retail complex that will be New York City's first outlet mall when it opens in 2018. New York firms Perkins Eastman and S9 Architecture are officially credited as associated architects on the project. The Ferris wheel was supposed to open this year, but court papers reveal a number of compromising problems for the $600 million project, the New York Post reports. 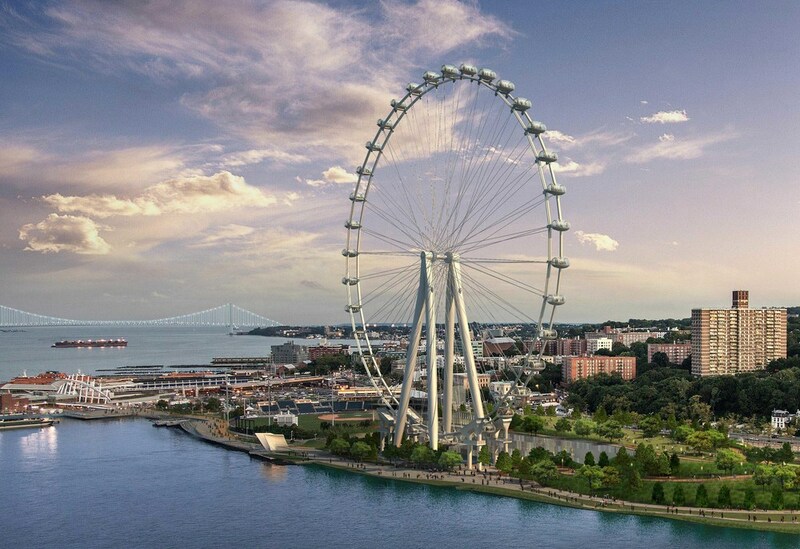 The developer, New York Wheel, alleges the designers, who are based in the Netherlands, missed many deadlines and have breached their $165 million contract. The two sides agreed to a 30-day mediation period that began June 12, though a construction livestream on the S9's webpage shows no activity at the job site. Opening day, the Post says, has been moved to spring 2018. The complaint, filed in federal court in Manhattan, details a number of issues with the project on both sides. Costs have doubled from an initial estimate of $300 million, and all this money didn't stop city inspectors from noting poor welding on the wheel's main legs, a major defect that has pushed back the approvals timeline. The base pad that the Ferris wheel sits on is faulty, too, while the wheel and the pad are attached incorrectly. The developers say Starneth, the same firm behind the London Eye, didn't use a manufacturer for the wheel's legs from the Department of Building's approved list, leading to a delay in approvals. In turn, the designers claim New York Wheel provided a bad pad for their wheel. This is the nineteenth in a series of guests posts that feature Archtober Building of the Day tours! Industry City 220 36th Street Brooklyn, NY Architect: William Higginson (1906) One of Industry City’s primary goals is to connect businesses and consumers in a more meaningful way by taking the mystery out of commercial production. Visitors to the 35-acre campus, for example, will be able to purchase items like gourmet chocolates while seeing the very same product pass by on a conveyor belt. At the same time, in a building across the courtyard, one can see and hear the work of an ironworker putting the finishing touches on a wrought-iron door. It is clear that Industry City’s adaptive reuse of the 16 buildings on its sprawling campus in Sunset Park, Brooklyn, is what makes this cacophony of production and collaboration possible. Today’s tour of the campus, led by Rob Marino, took us through what he called the “finger buildings,” or the 9 city-block-length warehouses buttressed by 2nd and 3rd Avenues. Originally built in the early 1990s, the warehouses are separated by sunken courtyards where trains once transported materials to one of three loading lobbies. In order to achieve a sense of unity between buildings, Marino explained, New York-based S9 Architecture conceived of “Innovation Alley,” which connects the central lobbies of the 9 warehouses, and is visually marked by red, ceiling-height wickets. To account for the previous loading system, Industry City’s 10-year renovation program called for the design of elevated sidewalks so that pedestrians could enter more easily. 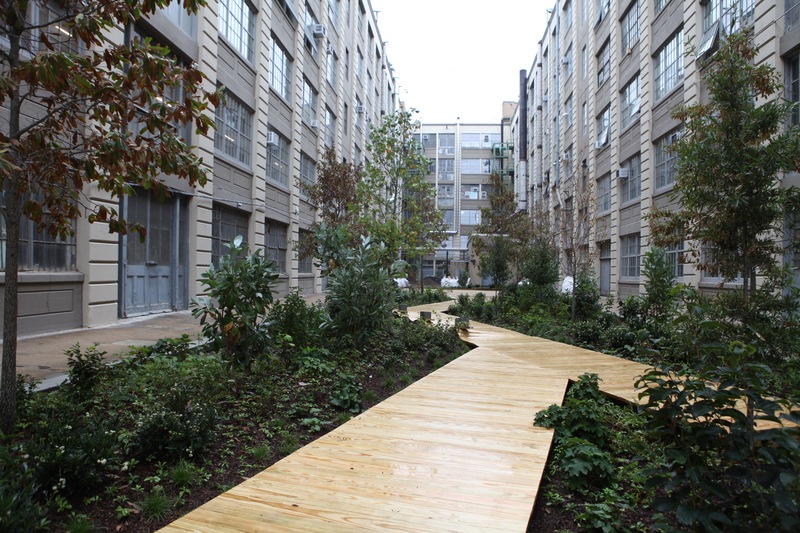 The program also called for the renovation of its courtyards into unique, useable space for employees. No courtyard is the same: The 3-4 courtyard (nestled between warehouses 3 and 4) was designed by Mathews Nielsen Landscape Architects, and features a sunken, sandbox-like pit and iron planters that establish sight-lines to the waterfront. In the 5-6 courtyard, Terrain landscaped the area with more mature plants that protect a zig-zagging boardwalk. Plans for 8-9 courtyard are to be determined during the next phase of construction. At the tour’s conclusion, we entered an unoccupied warehouse where cardboard boxes were once produced for close to a century. With 30-foot ceilings and immense windows, the space is impressive and gives a sense of what Industry City once was prior to the robust renovation program. After the space is brought up to code (and given a much-needed coat of paint), Industry City hopes to secure a tenant that can use the square footage productively and support the fine balance the campus currently has with its other tenants. By using multiple architects and encouraging businesses across food, culture, entertainment, and wellness sectors to use the space, Industry City has turned this once abandoned and decaying campus into a thoughtful workspace for a new economy. About the author: Kelly Felsberg is the Program Committees Coordinator at AIA New York. The Brooklyn Navy Yard is certainly having a moment: It just hosted the Bernie-Hillary debate in its 35,000-square-foot Duggal Greenhouse event space, and Duke Riley is currently performing his surreal, aerial, pigeon-powered Fly By Night project there. The proposed Brooklyn–Queens Connector (BQX) streetcar would link the 300-acre site to multiple subway lines. The Yard will be the new home of the Brooklyn Brewery, MAST Brothers Chocolate Makers, and now WeWork, the last of which will anchor a 16-story, 675,000-square-foot office building designed by New York-based S9 Architecture. Dubbed Dock 72, the building will be located along the water on the western side of the Yard. Rudin Development and Boston Properties are the developers behind the $380 million project, which the city government hopes will support technology and creative industries. “This project is going to help bring ideas, innovators, and start-ups to the Yard, where they can scale up their businesses, hire more New Yorkers, and manufacture their products right here in Brooklyn,” said Mayor Bill de Blasio in a statement. WeWork, which will occupy 220,000 square feet of the building, tapped S9 Architecture for the project back in 2013. S9 founding partner Navid Maqami said the site shaped Dock 72’s design in many ways: The land is not only narrow, bordered on three sides by water, but it’s also flood-prone. Consequently, V-shaped columns lift the building’s offices out of danger. The ground floor won’t be empty, however, it will house lounges, dining facilities, and a fitness center on the mezzanine level. On the upper floors, a series of open terraces take advantage of the site’s sweeping views of Manhattan and will serve as communal areas. The Dock 72 roof will feature conference facilities as well. Those terraces are complemented by a series of connected social spaces within the building. “We carved out these common areas that could be linked on multiple stories,” two or three at a time, via stairs, said Maqami. He explained that these shared areas aim to replicate the communal energy he found when he visited a WeWork coworking office. “It’s not about going to your cubicle or private office, getting it done, then going home,” Maqami said. S9 calls these multilevel social spaces the “ant farm,” and appropriately, the spaces will be revealed to the outside thanks to the building’s glazing. S9 riffed on the surrounding loft buildings’ facades, massing, and materiality to create a gridded exterior. The building’s facade also echoes the concrete gray and rust and brick red found in the Navy Yard. WeWork and the individual clients will design their own interiors. Fogarty Finger will design the ground-floor interior and some of the building’s amenities, which include "a first floor lobby, coffee bar and lounge, first floor market for specialty foods and beverage service, second floor juice bar/lounge, fitness center, wellness classrooms and spa, and 16th floor conference center and lounge," said Fogarty Finger in an email to AN. Dock 72 will be complete in two years. 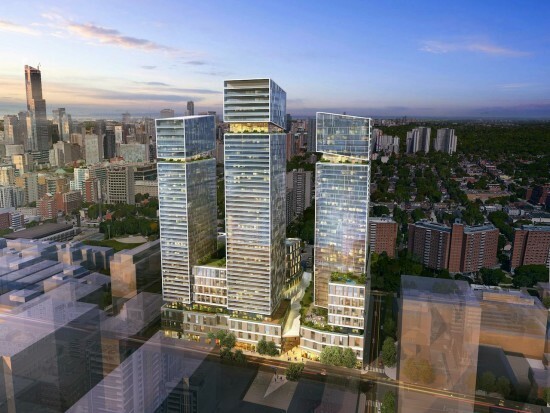 Arquitectonica in collaboration with New York firm S9 Architecture and Toronto-based Sweeney & Co. Architects have designed three mid-rise residential towers in Toronto, the tallest of which will be 526 feet high. The project is being spearheaded by WAM Development Group and will occupy a four-acre plot between 245–285 Queen East and Sherbourne and Ontario Streets as well as 348–412 on Richmond. Upon brief observation, the towers look like three lowercase i's aligned in a row. This is due to a recreational floor two-thirds up each of the towers. These spaces will house indoor and outdoor amenities including a living garden patio. The tallest tower, 45 stories tall, sits in the middle flanked by the other two slightly smaller buildings, both 466 feet high (39 storeys). At pedestrian level, the towers will be connected by a retail podium and public space. According to regional commentary forum Urban Toronto the "massive redevelopment will completely change the height, density, and urban character of Queen and Sherbourne." In terms of density, the trio of towers will add 1,645 housing units to the vicinity, being divvied up into 340 single bedroom; 832 single-bedroom with "den"; 235 double bedroom; 69 two-bedroom with "den", and 169 three-bedroom apartments. Of the 1,645 units, 1,110 are currently planned as rentable spaces. As for the public realm, brick paving has been used to contrast the glazed facade of the towers, creating a much more localized place and offering an alternate sense of scale. Within the area, protection from the elements will come in the form of a glass canopy so to maintain the aspect of openness. As Dumbo has become one of New York City’s most desirable and upscale neighborhoods, the hulking Empire Stores complex has been a persistent reminder of the neighborhood's industrial past—before the boutiques, multimillion-dollar apartments, and Brooklyn Bridge Park. The complex—a series of seven buildings—dates back to the 19th century and was originally used to store dry goods, primarily coffee. For decades, it has been positioned in Dumbo like an impenetrable fortress—a barrier between the cobblestone streets and the landscaped waterfront. But that's about to change. https://youtu.be/Bzhb1WBUNps In 2013, after many failed attempts to revive the Empire Stores, Midtown Equities (with Rockwood Capital and HK Organization) was selected by the Brooklyn Bridge Park Corporation, to transform the warehouses into a mixed-use facility. (To fund the park’s upkeep, development sites along the park are being leased to developers.) Plans for the transformation were originally drawn up by STUDIO V which proposed exposing much of the buildings’ original details, creating a rooftop addition, and cutting an open-air courtyard through the complex. In Spring 2014, S9 Architecture, a Perkins Eastman affiliate, was brought onto the project as well. While the architectural plans have changed throughout the process, the signature moves like the central courtyard and rooftop addition (with some tweaks) have been preserved. "I'm especially excited how closely the soon to be finished building remains true to our design from the original competition to the final details: the dramatic vertical slice of the courtyard with its bridges and suspended stairs, sharp profiles of glass and steel at the courtyard and addition, to the explosion of space and views of the rooftop park overlooking the Manhattan skyline," said Jay Valgora, founder and principal of STUDIO V, in an email to AN. The restored Empire Stores will include restaurants, offices, retail, a food hall, event spaces, and a rooftop beer garden. The full complex is scheduled to be completed in the spring. As construction continues at the Empire Stores, The Architect’s Newspaper got a look inside the site with Navid Maqami, a design principal at S9.